Hawaii’s most visited island, Oahu has much to offer besides the clamour of humanity in Honolulu. The rest of the island is amazingly rural, with large areas filled with sugarcane fields and rain forest where wild boar still roam. It is easy to escape into Oahu’s spectacular scenery as jungle-clad roads and trails transport you from the high-rises of Honolulu. I spent several weeks researching and planning my trip to Oahu with the help of DK Eyewitness Travel’s Top 10 Honolulu & Oahu. It was after an endless note taking session while flipping through the pocket-sized guide that I realized Oahu may just be the perfect road trip destination for two best friends to tackle together. Nicola would be joining me as my driver extraordinaire while I stuck to passenger seat duties which had me (attempting) to get us here, there and everywhere with ease. Oahu truly has it all. World class beaches, jaw dropping natural landscapes and tranquil temples contrast perfectly with Honolulu’s cosmopolitan vibe. Spend your weekdays road tripping around the island and weekends in Waikiki enjoying the city’s stellar museum’s, luxurious hotel haunts and a uniquely Hawaiian late night dance-a-thon. Size: super thin and packed full of useful quick tips. Easily slips into your pocket while walking the beach and rests gently on the dashboard within arms reach as you’re rolling along the highway. Includes Map: in the books back pocket you’ll find a detachable waterproof map which comes in handy when you are spending so much time on the beach. 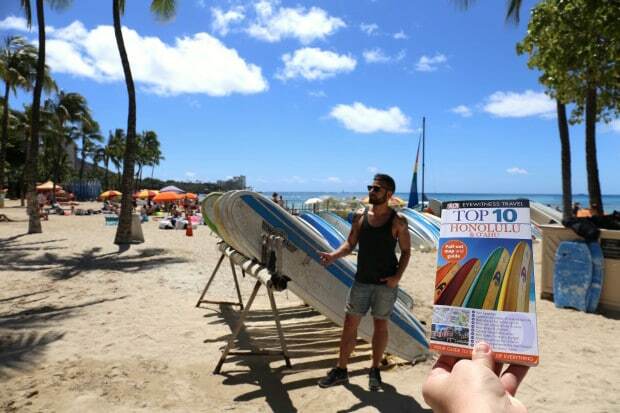 Great Top 10 Lists: the first few chapters of the book are dedicated to the Top 10 most visited attractions on Oahu while the remaining are niche lists which are handy for those who have unique interests. Examples include surfing beaches, local dishes and Hawaiian history. Insider Tips: the guide is full of useful insider tips and tricks and answers a lot of great questions you might not even think to ask. What’s the best way to access the hiking trail? How much does parking cost at the national park? What day of the week is the museum free? Waikiki was a nondescript place filled with taro patches and fish ponds when Kamehameha I, the chief who united the Hawaiian islands, landed here to launch an invasion in 1795. 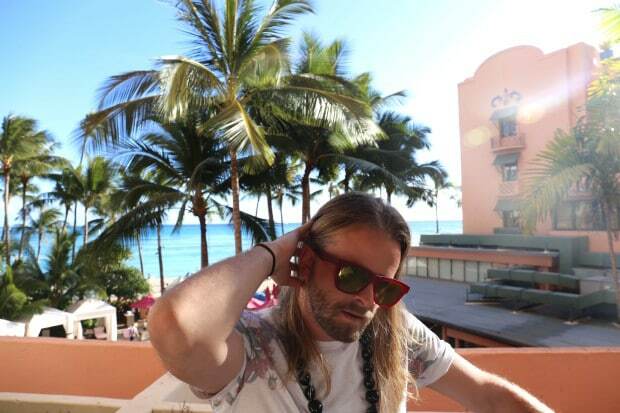 After conquering the chiefs of Oahu, he built a bungalow facing the ocean, not far from the present Royal Hawaiian Hotel. 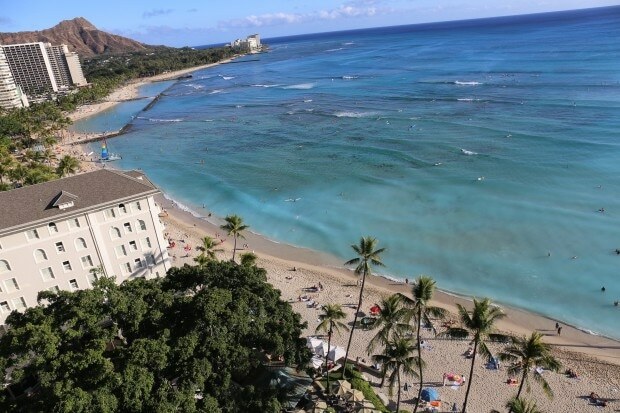 Now Waikiki is known as one of the world’s most famous beaches, a sliver of tan fans against the backdrop of Diamond Head crater. Waikiki’s “golden mile” of glass and concrete skyscrapers is a hectic hodge-podge of Western, Asian, and Pacific cultures bustling with some 65,000 tourists a day. The streets are packed with T-shirt vendors, sunburned honeymoooners, Japanese matrons with Christian Dior bags, and barefoot boys carrying surfboards on their bikes. Built in 1927, the iconic Royal Hawaiian, known as the “Pink Palace of the Pacific,” ushered in a new era of luxurious resort travel to Hawaii. A landmark on world-renowned Waikiki Beach, the resort maintains its original grandeur while offering a rejuvenated sense of place. Contemporary updates blend effortlessly with its signature grand hallways and Spanish-Moorish cupolas, presenting a chic atmosphere that is elegant, yet sophisticated. We stayed in a posh pad at the resort’s Mailani Tower which recently opened in April 2015. Guests feel as though they are staying at a “hotel within a hotel” as they have their own dedicated concierge (a breezy check-in experience) and access to the exclusive Mailani Lounge featuring complimentary breakfast spread in the morning and sundowner snacks and sips in the eve. Mailani’s rooms offer a modern counterpoint to those in the resort’s Historic Wing with a distinctly breezy, airy, beach-inspired feel with modern, chic touches, while still maintaining the signature mold of luxury for which The Royal Hawaiian is known. To the delight of fans of The Royal Hawaiian, Mailani rooms feature many hints of pink with detail points creatively laid out in each guest room. Boudoir pillows and Frette-brand bathrobes are a fresh shade of pink, as is the upholstery on the desk chairs. In addition, each Tower room features original artwork by celebrated local artists who were commissioned to create paintings through inspiration from the hotel and its surrounding area. Named after the famed tropical cocktail, the legendary Mai Tai Bar at The Royal Hawaiian offers a beach and bar experience found nowhere else in Honolulu. Sumptuous hand-crafted cocktails are made with fresh, local fruits and juices to quench the thirst. Start sipping two hours before sunset and grab yourself a coveted front row view of Waikiki Beach and Diamond Head as the sun slowly splashes across the horizon. 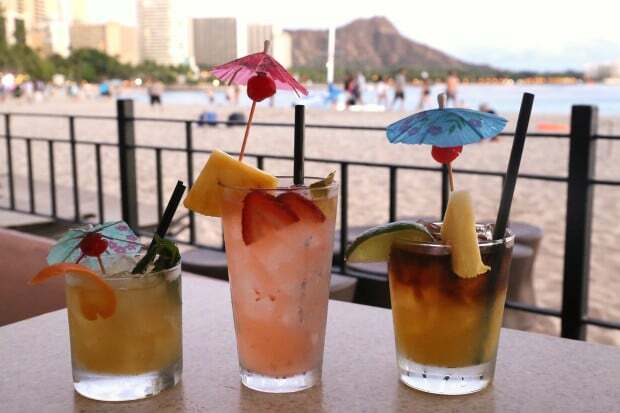 We ordered a trilogy of signature cocktails (Royal Scratch Maitai, Farmers Market Mule, Honolulu Smash), pretty umbrella adorned libations which will have you right and ready to tackle the evening ahead. If you’re a history buff looking to treat yourself to a little rest and relaxation in Honolulu head to the historic Moana Surfrider. 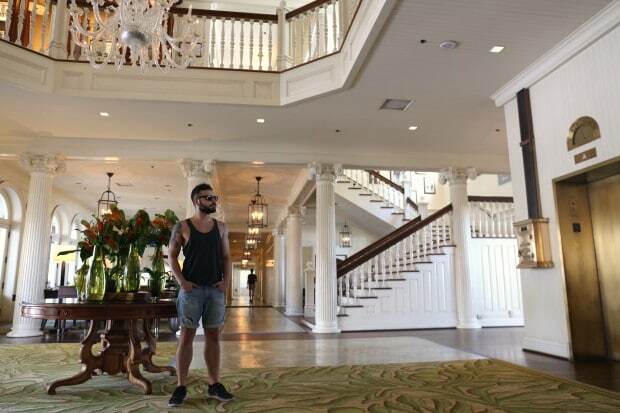 An ode to Victorian elegance when it first opened in 1901, the modern luxuries of the Moana boasted the Territory of Hawaii’s first electric-powered elevator and guest rooms had their own telephones and private baths – true innovations at the turn-of-the-century. In October 2008, the hotel debuted its new 17,000 square-foot Moana Lani Spa, Oahu’s first beachfront spa and the island’s only Heavenly Spa by Westin. The space features two couple’s treatment suites with private ocean front lanai and whirlpool tubs; nine custom massage therapy rooms; one body treatment room; a Vichy shower water therapy room; three custom facial rooms and a 24-hour fitness center. I enjoyed the spa’s signature treatment Na Mele (a mix of traditional lomi bodywork paired with Hawaiian Lullaby melodies) in a spacious couples suite featuring freshly bloomed orchid, whirlpool tub, glass of champagne and breathtaking view of Waikiki Beach below. Now I understand even more why anyone would want to get into the Lomi Lomi business or anything to do with massages. If you can make someone feel as relaxed as I was when I visited a spa, I can only imagine how rewarding seeing happy customers after each session would be. If you’re a craft beer fan looking for a sud-sloshed lunch hop up at the bar at Waikiki Brewing Company. The petite brewery is attached to Cheeseburger Waikiki, an island-themed burger joint decorated with Americana kitsch. The brewery was born when the restaurant’s GM Joe Lorenzen saw untapped potential in the restaurants often unused banquet room. As a home brewing hobbyist, his dream was to use the space to brew beer. 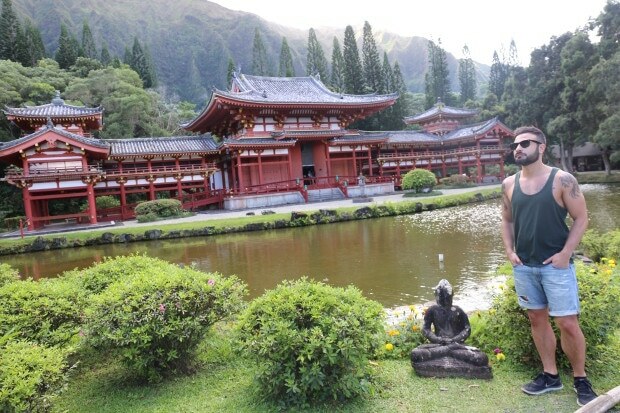 After completing coursework with the American Brewers Guild, Joe is now brewmaster for the Waikiki Brewing Company which produces a wide range of beers from pale ales to porters, and everything in between via their seven barrel brewhouse. Popular brews fresh from the tap include Aloha Spirit Blonde Ale, Hana Hou Hefe and Black Strap Molasses Porter. 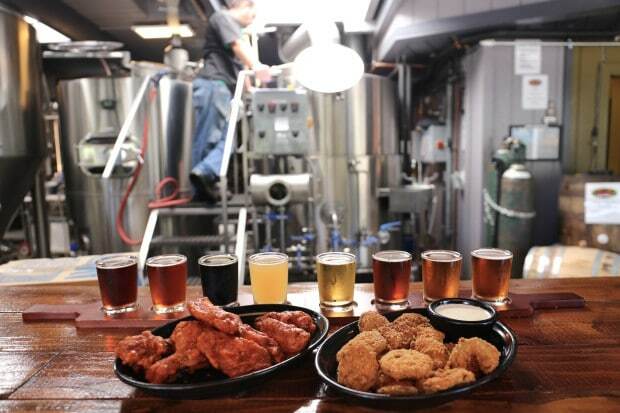 If you’re looking to pair your bitter flight of beer with the perfect munchies be sure to order their spicy sriracha wings and crispy deep fried pickles. 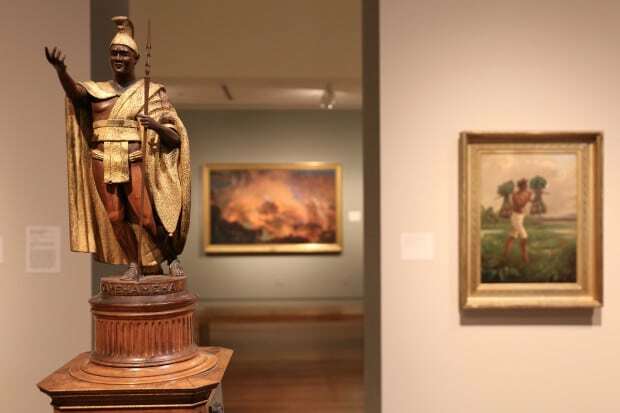 The Honolulu Museum of Art is Hawaii’s only general art museum and comprises 30 galleries. It was founded in 1927 by the eclectic collector Anna Rice Cooke, whose home had become crammed with more than 4,500 pieces of artwork. The gracious stucco-and-tile building in the style islanders call “Territorial” was erected on the site of her original house. The permanent collection includes more than 20,000 works of Asian art, with the highlight being the James A. Michener Collection of more than 10,000 Japanese ukiyo-e woodblock prints. The museum also features European art, notably Italian Renaissance paintings and works by Van Gogh, Monet and Picasso. American works on display include pieces by Mary Cassatt and Winslow Homer. 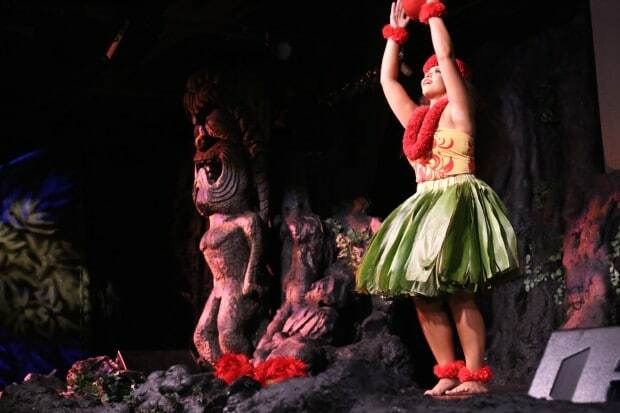 If you’re keen to tap into traditional Polynesian fashion, dance, music and culture head to Honolulu’s popular dinner theatre, Te Moana Nui at the Sheraton Princess Kaiulani Hotel. Guests begin the evening by enjoying an extravagant buffet while a local band and beautiful hula dancer entertain. Chef Chris Kirksey’s spread features an abundance of sushi rolls, ahi poke, lomi lomi salmon, steamed crab legs, kalua pork and huli huli chicken. After dinner glide up an escalator to enjoy Te Moana Nui, an inspiring display which takes guests on a Polynesian journey where the history and culture of the Pacific come alive. Te Moana Nui brings to life stories of the Pacific Islands through a series of dances which reflect the unique traditions of the indigenous peoples of Hawaii, Samoa, Fiji, Tonga and Tahiti. The craggy 762 ft pinnacle of Diamond Head, immediately southeast along the coast from Waikiki, is Honolulu’s most famous landmark. Ancient Hawaiians knew Diamond Head as Lei’ahi “wreath of fire” a reference to beacons lit on the summit to guide canoes. They built heiaus in and around it, slid down its walls to Waikiki on holua land-sleds as sport and threw convicted criminals from the rim. 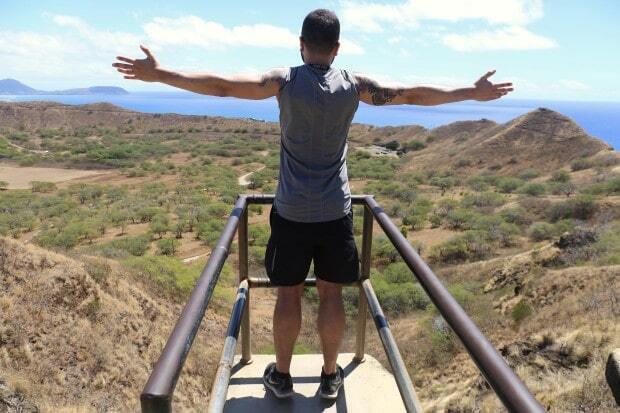 Today the only reason anyone comes to Diamond Head is to hike the hot half-hour trail up to the rim for a grand panorama of Oahu’s entire southern coast. The trail climbs slowly away from the crater floor and meanders up the inside walls. Many of the holes visible but out of reach on the hillside are ancient burial caves. Before long you enter a vast network of military bunkers and passageways that riddle the crater. After passing through a long dark tunnel (see, it really is an adventure!) you’ll climb a few hundred steps, march up a spiral staircase and then finally find yourself jumping out into the sunshine where jaws drop for a spectacular view. My favourite hidden gem on the island is without a doubt Doris Duke’s Shangri La. Located in a ritzy suburban neighbourhood a short drive from Diamond Head, guests are only able to access the private property via daily tours which depart from the Honolulu Museum of Art. You really need to know about the place to experience it and it’s a popular attraction for art and architecture fans so be sure to book your tickets in advance. 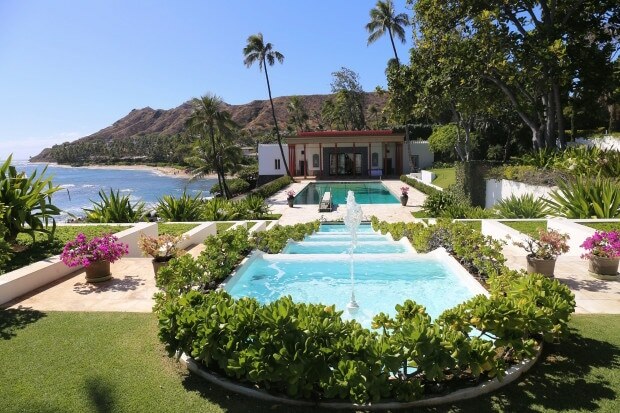 Doris Duke’s Shangri La is a magnificent dream home turned museum, a perfect paradise created by the daughter of a tobacco tycoon who was one of the richest men in the world at the time. She traveled widely, immersed herself in other cultures and pursued a wide range of interests including the performing arts, historic preservation, environmental conservation and the preservation of wildlife. She was also a major collector of Islamic art, assembling a collection of more than 2,500 pieces and exhibiting it throughout her Honolulu home Shangri La—a sustained effort of nearly 60 years. Take a quick left off the hustle and bustle of the highway and you’ll find yourself quickly calming as you slowly roll through Valley of the Temples Memorial Park. Yes, it’s a cemetery but it’s also a place to take in the islands’ cultural diversity and the beauty of the Ko’olau mountains. It’s not uncommon to see entire families picnicking near the graves of loved ones; graves of Buddhist are equipped with food and incense to honour their spirits. At the rear of the memorial park, against the mountains, this other-worldly structure is worth the park admission alone. It’s a scale replica of the 900-year-old temple at Uji in Japan, watched over by an immense incense-wreathed Buddha. Enjoy banging the deep-toned gong (a boom which lingers through the forest) and enjoy feeding pretty black swans which gently putter up an orange tinted river teaming with colourful koi. If you’re heading to Hanauma Bay for a beach day on the south shore it’s worth stopping at the lookout below the Makapu’u lighthouse for humbling views of sky and sea. You can watch the action on nearby Makapu’u Beach, a pocket cove that boasts the island’s best body-surfing waves and enjoy sweeping views of Rabbit Island, a dramatic landmark offshore. The first Chinese immigrants arrived in Hawaii in 1789, followed in 1852 by a large number who came to work on Oahu’s plantations. On completion of their contracts, many gravitated to downtown Honolulu and opened restaurants, herb shops and clubhouses. Fires in 1886 and 1900 nearly destroyed the neighbourhood, and the area fell into decay. Today, after an extensive rejuvenation project, Chinatown is once again a thriving community where historic shrines and temples stand alongside colourful lei stands, herbal-medicine shops, vibrant farmers markets and trendy art galleries and restaurants. When the sun sets, Honolulu comes alive with the fashionably dressed sights, pulsing sounds and delicious smells of Honolulu Night Market. 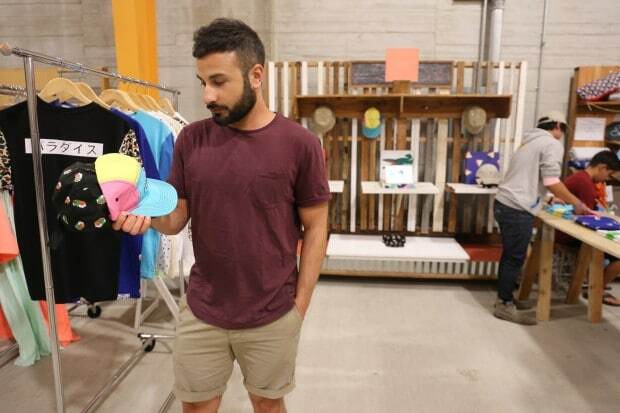 Held every third Saturday of the month on Auahi Street, this nighttime fete is the place to see and be seen with art demonstrations, fashion shows as well as some of the island’s favorite food and fashion vendors. 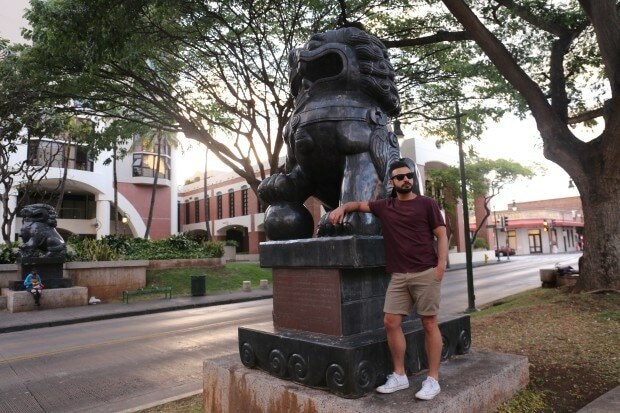 Founded by local entrepreneur Poni Askew of Street Grindz, Honolulu Night Market has an edgy and hip vibe that caters to both urban trendsetters and families. Grab a bite at one of the popular food trucks outside then browse the rows of local vendors to pick out a few one-of-a-kind gifts while art demonstrations, fashion shows and live music entertain late into the night. The Dole Cannery, built by James Dole in 1903 next to his Wahiawa pineapple plantation, was at the time the world’s largest fruit cannery. 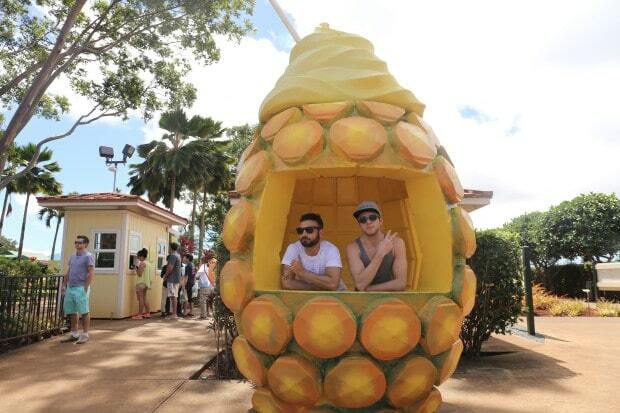 Today tropical fruit fans flock to this “Disneyland of Pineapple’s” as a sweet stop before exploring the island’s North Shore. The property features a massive gift shop, restaurant (be sure to share spoons over a bowl of iconic Dole Whip), choo-choo train, demonstration garden which shows the different stages of the fruits growth and a popular Pineapple Garden Maze, which is the largest maze in the world, with 1.7 miles of paths that cover more than two acres! Continue north on the highway until you’ve passed through the sleepy village of Hale’iwa. You’ll find a long line snaking out of Matsumoto’s Shaved Ice (which you’ll want to immediately hop behind). 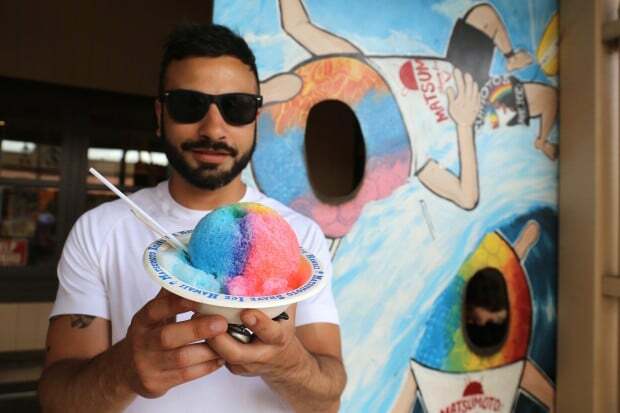 Shaved ice has carved its place in Oahu, and put smiles on faces since the 1940’s. Back then it was a simple snow cone with basic flavours such as orange, lime, cherry and grape. Matsumoto’s Shaved Ice which first opened in 1951 is Hawaii’s most famous spot to enjoy the refreshingly sweet treat. We ordered the signature “Matsumoto” with soft serve and sweet beans which arrives looking like a rainbow blossom ready to be devoured. 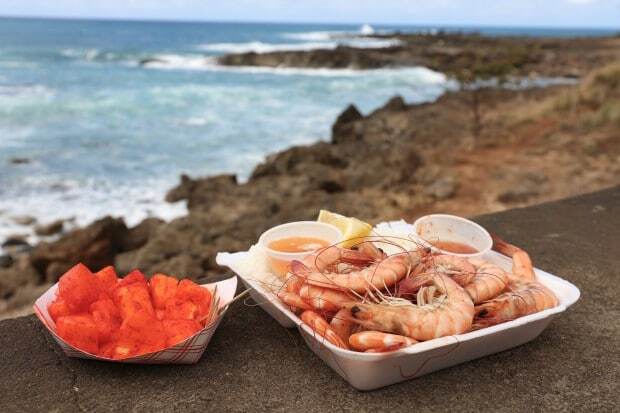 Continue enjoying the scenic drive along the North Shore, passing all those dreamy surf beaches in search of local food fav Romy’s Kahuku Prawns and Shrimp Hut. You’ll find a massive line snaking down the highway at all hours of the day so prepare to relax and tan in the sun while you wait to place your order. Harvested daily, Romy’s prawns and shrimp are cooked live, offering the most succulent seafood on the island. The dinning options onsite are basic picnic benches which sit under white tents which are a bit boring when only a few minutes drive away you can sit al fresco overlooking the ocean. So grab an order of steamed prawns to go with a sweet tray of plum sugar tossed pineapple and enjoy your well earned meal with the crash of waves at your feet. Spend the rest of your afternoon digging your feet into the sand at the North Shore’s most popular beach, Waimea Bay. This legendary surf spot features a wide sandy beach perfect for tan fans looking to rest and relax. Jumping off the large rock outcropping in the bay is a favourite pastime among local daredevils while swooning for handsome lifeguards who sit perched on their Baywatch lookout tower is a less dangerous and perhaps more rewarding way to enjoy the day. Honolulu offers an impressive offering of gay bars for those looking to sip tropical cocktails under dazzling disco balls late into the night. Our favourite of the bunch, which we ended up returning to night after night, is Hula’s Bar and Lei Stand which has been serving limp wrist Aloha to locals and international jet setters for over 42 years! Hula’s is located on the 2nd floor of the Waikiki Grand Hotel, offering spectacular views of Diamond Head and gorgeous Waikiki beach sunsets. 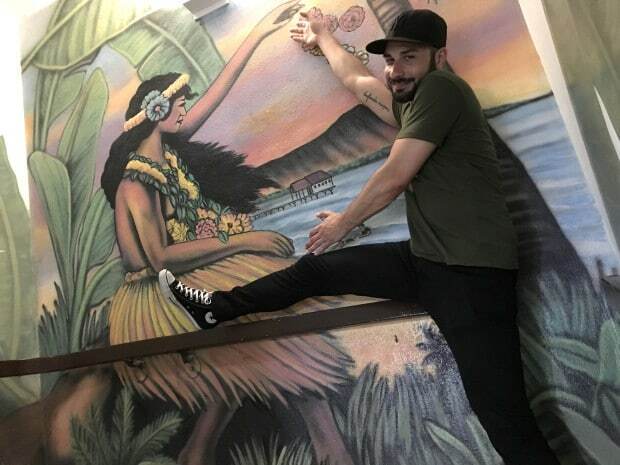 Grab a drink at the bar and you’ll quickly fall in love with Hula’s delicious duality: friendly locals are curious to know where you’re from and how you’re enjoying the island while swarms of other gay tourists trade road trip stories and a tale or two from home. Late at night DJ’s play poppy beats to a dancey crowd while Go Go Dancers prance through strobe light illuminated fog.